Derek: Good afternoon or good morning just depending on where you are at in the country. Glad to have you on for a 60-minute webinar today on the topic of "Preparing Your Home Care Agency for the Affordable Care Act" and we have really, just an incredible agenda today. First, we'll go over any housekeeping items. Let's go ahead and cover those now. This call is being recorded, that's the number one question we always get at the beginning. So for those of you, we know you're busy, you're in an office, the phones are ringing, you've got caregivers coming in. This webinar is recorded and we'll make it available within about a day or so after the webinar has concluded. We will be taking question and answers at the end of the webinar. We'll have at least 20, maybe even 30 minutes of Q&A because we know there are going to be a lot of questions. So we've intentionally left a lot of time for Q&A. To ask questions, in your upper right hand corner, there should be a GoToWebinar panel with an orange or red arrow. If you click that arrow, it will expand the GoToWebinar panel and there will be a chat and a questions box at the bottom. As you have a comment, questions, any insight how your agency is handling some of the topics that we're talking about, feel free to input questions or any of those topics as the webinar continues. And at the end, we'll compile those and answer any Q&A. Then we'll go into an intro of our guests. Which, Jason Brown is on the phone with us today and he will cover some high-level overview of the Affordable Care Act and the employer mandate, and specifically, how that is going to impact home care agencies. Then, of course, agencies have . . . once they have the baseline understanding of the ACA, you have some choices to make and those choices are coming up very quickly. Will agencies pay, play or do nothing? And we'll talk about those scenarios that agencies have and how to think about walking through your office and how to prepare and how to make that decision at your local office. We also have put together a couple of tools that we'll present throughout the webinar. We know this webinar is just an event. We want to make sure that this learning continues even after the webinar. So we've provided some tools that whether you're a marketer, a coordinator, a director or a scheduler or recruiter, we want to give you some tools that you can take back immediately after the webinar to inform the rest of your team on the topics that we're discussing today. And then we will have at least 20, 25 minutes for questions and answers. With that, again, thank you so much for being with us today. We know you're very, very busy. So we before dive into the content, just a practical reminder, we will be talking about some advanced topics on the Affordable Care Act. And while we do have an attorney on the phone with us, every home care agency should have local counsel and an accountant. Your local rules are very specific to your state and to your locality, and none of the information on this webinar should constitute legal or tax advice. We know you know that, we want to make sure that we put that out there. So how have we formed the agenda today? Well, as we always try to do, we want to make sure that every slide, every word, every slide that we have is really purposeful in covering the topics that are important to you. So we have several hundred agencies who've registered for this webinar and when you registered, we asked you a very simple question: "What are your learning objectives for this ACA webinar?" So we've captured a few of the most common responses and a response from Andrew Howard in Daly City, California wants to know how to efficiently comply. So notice Andrew's assuming that his agency is going to comply and that is certainly one option. We also have, I would say, a dissenting comment, which is okay and is fantastic for this webinar just for getting different perspectives. But Karen Curry in Pittsburgh notes, "I don't believe that there is a major impact on our agency," and that very well could be the case, and Jason will walk us through if you're an agency today, how do you even know if you will be affected by these changes? Bill Wright in Statesboro, Georgia says, "Do I pay or play? Which is effective for us when?" And we actually thought that those buzzwords were . . . they resonated with us and we've actually formed the agenda around paying, playing or doing nothing. So Bill appreciate helping us form the agenda here. Celina in State College, Pennsylvania also asked, "How can ClearCare or even just technology ease this implementation?" So we've taken these four cornerstones and really have made these the pillars of the agenda for today. Before I pass it over to Jason, we'll do quick intros. My name is Derek Jones. I'm the director here at ClearCare Online. ClearCare Online is a non-medical agency software solution that handles billing, payroll, marketing and referral management. We're based out of San Francisco. We work with top national brands across the country in thousands of local, small-medium businesses for their software needs. And we are honored to have, really, the specialist on the phone today and I'm going to quickly get out of his way and turn the presentation over to Jason Brown. But before, let me give you an intro of Jason so you know that he is highly experienced and has a lot of knowledge in this area. Jason received his JD from Seton Hall University of Law. He also received his BA from Harvard University where he studied biochemistry. I don't know what inspired you to do that, Jason, but more power to you. And while he was at Harvard, he was also a four-time varsity letterman on the baseball team. He is now an associate at Fisher & Phillips, which is a national law firm that has 31 offices, 300-plus attorneys across the U.S. and they represent clients in a number of disciplines in all 50 states. So Jason, welcome to the webinar. Derek: And we're going to turn it over to Jason here. The last word I wanted to leave before we turn it over to Jason is the Affordable Care Act is a complex topic, and it's coming up quick. We know that all agencies across the U.S. are wondering how this is going to impact and this is potentially a major change for agencies. We want to remind you that the picture that you see here on the screen is of me going through a car wash. And the kind of funny thing is, if you've ever kind of been the adult kid and asked to sit in the car wash as it goes through, it's kind of disorienting, there's a lot of noise, you can't really see out. But you know, eventually, that you're going to get out. I think there's a parallel here for thinking about the Affordable Care Act. Is let's recall that while the ACA may impact your business and may adjust the way you need to manage your business, we are going to come out of this successfully. And that's what this webinar and this series is all about, is bringing knowledge leaders, bringing agency owners together to discuss the topics and also share best practices on how to navigate this. So just remember, we are in one of the best businesses there is to be. If you're in a restaurant business today or you're with low-margin businesses where real estate is going up, a lot of businesses, a lot of sectors are very, very envious of the position that we're in, as non-medical home care companies, even despite the regulations that are coming. So just remember, we are in a great business and thank you for everything you're doing and I'm confident that as we work together, we're going to get through this together. With that, I'll turn it over to Jason to start an overview on the Affordable Care Act. Jason: All right, thank you, Derek. Hi, everyone, my name is Jason Brown and I thank you, Derek, for that wonderful introduction. Just to get started, this is an area that I am very passionate about and you're here as well, so I'm sure you're passionate about it as well, or at least curious about how it's going to impact your business, which is really what we all need to focus on at this point. 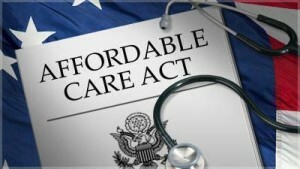 What the Affordable Care Act is and the meaning behind it, all of that is not really relevant to us as business owners. What we need to know is how it's going to impact us, if at all. But I want to start a little bit with sort of an overview of what the ACA is and really, why we're here today. 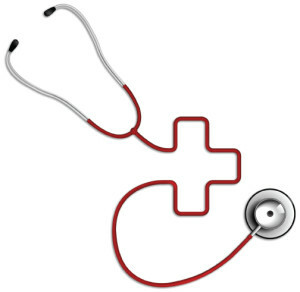 What we saw in March of 2010 was an initiative from the federal government to try and extend healthcare to the general population. Now, it doesn't apply to everyone and it doesn't apply to every business. But what we're seeing is basically four key components. The first is the individual mandate, which is basically this idea that everybody has their own requirement, their own responsibility to get health insurance, and f you don't, you have to pay a penalty. Now, the government has set up insurance marketplaces. Some states have done it, they've had the option to do it. I know here in California, we're one of the leaders in that area. But other states in which you live might not have them and if they don't, then there's a federal marketplace in which individuals can get this information. Now, as business owners, it's very important for you to understand that, because you can help your employees get that. And especially if you're a small business, if you don't have that many employees such that you fall outside of some of these issues we're going to be talking about later, it's good to let your employees know what their requirements are and help them not to avoid that tax penalty that they'll be facing on the individual mandate. Likewise, we have the Medicaid expansion. Originally, every state had to do it, but the Supreme Court decided that states could decide if they wanted to do it or not. So you need to look at your local or even county-level programs to see what type of expansion has been done for Medicaid. Now that's important because a lot of our employees in this industry tend to be fairly low wage-earners. The big thing about the Medicaid expansion was for the first time, the amount of money that somebody earns will entitle them to government Medicaid. Previously, it had to be disability or something like that. So now, if you have a low wage owner, you might be saying to yourself, "I have to buy them health insurance? They don't even make any money for me." Well, the answer to that is if you're in a state where there's been a Medicaid expansion, just advise them on how to go and get government-subsidized medical coverage, and then you as the employer will not have to worry about them going to the exchanges and potentially setting you up for those major penalties that we'll be talking about. And that's the employer mandate and that's what we're going to be focusing on for the rest of this morning or afternoon. And that's this idea that employers need to shoulder the burden of providing health insurance to their employees, if they reach certain thresholds. All right. And the first thing we're going to cover is whether you're a large employer and whether you're even going to fall into this at all. All right. Many of you might not. But many of you, and my guess is the majority of you, are going to fall into this category. And especially this sort of dangerous category of having between 50 and 100 full-time employees. But the good thing about that is if you're in that area, even the IRS knows that that's a dangerous area. They've started to extend the time in which you need to comply, if you're in that zone. All right, so that's the overview. We're going to be, of course, covering the employer mandate today, primarily. But of course, during our question and answer, we can cover basically anything if you have questions about the Affordable Care Act. Derek, I'll turn it back over to you. the first time you've heard it, you'll want to refresh and maybe you picked up a couple additional details if you've heard of the ACA as it relates to your business. But we have provided a one-page PDF that is a quick reference guide and overview of exactly what Jason just mentioned, and that can be downloaded for free at the Web address that you see here, and that is available, immediately, that you can download. Jason: All right. So a lot of the literature out there about the Affordable Care Act is highly political. You're going to see a lot of polarized articles and commentary about how bad it is or how great it is, usually how bad it is. And I say that candidly, I'm a big supporter of the ACA, but there's a lot of criticism of it. And the reality is that I think a lot of that comes from the unknowns. People are afraid of what they don't understand. They're afraid of what they don't know. And even the experts who wrote the Affordable Care Act don't know exactly how it's going to play out in practice. When you have changes and delays and rulings by the Supreme Court and interpretations by the IRS, it only increasingly complicates the application of what originally was a fairly ideological change in our healthcare system. And one example of this, just so you know how much this is changing and how if you are very much interested in this topic, you can get a lot more information. In September of 2014, so last month, the IRS released its most recent regulations and rules about how they are going to be looking at the tax consequences of the employer mandate. Okay. So you, as the business owners, it's maddening. It must be maddening. Because you want to know what you must do and you don't know because the IRS doesn't even know and they are telling you, last month, for the first time, how you can deal with some of these issues and what penalties you might be facing. So I would say just stay on top of it, do the best you can. You're doing the right thing by attending these webinars. And don't worry too much, but you certainly need to start preparing now, because like I said, the IRS, when they audit you in 2016, is certainly not going to care how delayed they were. Okay. The other thing is, like I mentioned, if you're in that range of 50 to 100 and that's the most dangerous range - I've been saying that for about three years now. The White House did recognize that and they actually delayed that under this quasi-medium-sized employer, which is nowhere in the ACA to 2016. So because the IRS has not gotten their stuff together and because there is a particular range of employers that are in real danger because of the potential tax penalties, you actually have another whole year. So that's what we're doing there. We can go to the next slide, Derek, if we can. Thank you. So what we're going to do today is we're going to basically give you a basic game plan for identifying what you need to do, the questions you should be asking. We can't tell you everything about your company; there's so many different companies. You all have different types of employees, different hours that are being worked. But there is one thing that everybody has in common, is that you need to be able to understand the data, the hours that are being worked, understand your workforce. And the first question you need to ask, of course is, are you a small employer? Are you this medium-sized employer or are you a large employer? Technically, under the ACA, a large employer is anyone who has 50 full-time or full-time equivalents, you put those together. Okay. Now, like I said, if you're between 50 and 100 or 50 to 99, you're going to have a little bit more time. You want to definitely identify where you are. If you're over 100, you're pretty much out of time. You should have already been putting things in place and we'll talk about how we can speed you up and get you to where you need to be. But the calculation is fairly simple. If you have a full-time employee, meaning somebody who's going to work 30 hours a week or 130 hours a month and you're anticipating that's what they're going to work based on their schedule, just count them as a full-time employee, okay? That's a full-time employee and put all of those folks to the side, all right? Now, if you do that and you're already over 50 or you're already over 100, you really don't have to go any further. But if you're one of those companies that's somewhere in that range, then you need to just calculate your full-time equivalents, okay? And the way you do that is you take all of those people who are not full-time and you add all of the total monthly hours and divide by 120 to calculate how many you have each month. Just to further complicate things of Obamacare or the ACA, is calculated on a monthly basis, it's not done annually. And that's what's thrown at the IRS for a little bit of a loop, because they're an annual organization. So you need to do it month-by-month. So if you're one of those companies that has a lot of turnover, and many of us do, clients come and go, caregivers come and go, you're going to have, say, 54 in one month, 49 the next month. It can change month to month. You're going to then want to average those out over a course of basically 12 months. There used to be a 6-month provision, but at this point, you have to look back for 12 months. That said, there's another way to do it, okay? And this is something that I've been advocating since the fall of last year, when the IRS first released some of this information. And that's doing what's called a measurement period, a stability period and an administrative period. Now, this is a little bit more complex and I highly recommend that you bring in somebody professional to analyze your organization if you want to set these up. But this is an opportunity, because there was a frustration among companies that did not really know how many hours somebody was working over the course of an entire year. This happens in agencies with a lot of turnover. In fact, this was a specific question that was asked to the IRS from this industry, from the home care industry. What about those employees who, it's really hard to tell whether they're part-time or full-time? Because sometimes, they work full-time hours. Because, for example, if they're a live-in employee. But other times, they're not working at all. Half of the year, they're not even working when they drop off of a case. Well, is that a full-time employee? Well, if you're the type of agency that has those types of questions, you're definitely going to want to employ what's called the "measurement period" and that's a rolling 6 to 12-month measurement in which you don't immediately have to provide health insurance. So long as you provide a measuring with a guarantee of a stability period, then you're going to be fine. And that's something the IRS is going to allow. So I'm not going to go into too much detail about that. Just know that that is an option and that if understanding your workforce is going to be difficult, then you can have that option. And of course, that all comes back to do you even know how many hours all of your employees are working? And do you have the ability to actually track that data? You might have it right now on paper, you might have a telephonic system, but do you have the ability to track and analyze that data and really be able to tell, with enough specificity, whether somebody is going to be a full-time employee or how many full-time equivalents you have, without an administrative nightmare occurring. And that's actually, that's something ClearCare is . . . there is no match for what they can do. Because they can log in all of that information with their ACA tools. They can tell you right away whether somebody is going to be in one of these categories, and that’s a tremendous resource to have. All right. Go to the next one, Derek. Thank you. So if you understand that part of it, how to understand whether you're a large employer or whether you're a medium or whether you're a small . . . and remember, if you have less than 50-time employees, full-time equivalents, then there's nothing. You don't have to worry about anything and this chart is basically what to do with that information. Okay, so first, you have to find out how many employees you have. Then you have to identify whether you are large, medium or small. And then, if you are large or medium is 50 to 100, but we're calling them "large" here because that's what the ACA would call you, you need to know whether to pay or play, okay? You've probably heard that terminology before, I don't even know where that came from, originally. It's certainly not in the legislation. But paying or playing is this question about whether you're going to. . . sorry, I've got a request to speak up a little, let me turn up my volume. Hopefully that's a little bit better. So basically it's this question about whether you are going to pay the penalties, just not deal with this health insurance issue, not deal with the amount of money that you have to pay. You'll see where that might be something you want to do. "Play" meaning you're going to go and get your health insurance or do nothing. Which basically means - you're not going to do nothing in the sense of being an ostrich and putting your head in the sand. You're going to do nothing in a sense that you don't have to do anything. You've identified yourself as a small employer or you've identified yourself as someone who isn't going to incur any tax liability. Those are the people that might not have to do anything. So first, are you a large employer? If no, just do nothing. However, if you are a large employer, meaning you have 50 full-time equivalents and employees when you combine them together, then you have to ask this question: Are any of your employees going to an exchange and getting a credit? Okay. So that basically means that if you haven't provided health insurance, have any of them gone to an insurance exchange and actually gotten credit? All right. If the answer to that is "yes", then you're going to be hit with a penalty. That's what the penalty is for. It's to help the government offset providing credits on the exchanges. All right. Now, there's a safe harbor, okay? You have to look at if you're the type of company that does not have a lot of full-time employees. For example, a lot of home care agencies have their administrative staff, most of them are going to be full-time employees. You might have a couple of live-ins out there who are full-time employees. But you also might have a bunch of part-time employees out there. If you're an agency that has a lot of time part-time employees, well, you have a 30 full-time employee safe harbor. So if you don't have more than 30 full-time employees, it doesn't actually matter whether people are going on an exchange to get a credit, all right? Because you have that safe harbor of 30. There has been some talk of expanding that safe harbor even further, although I haven't been able to verify whether that's actually occurring. So for now, it's that 30 safe harbor. Some of you may have heard of this term called the "Race to 29". You also may have heard about how companies at the national level are starting to cut people down to be part-time. All right. A lot of people think that that's because if they're part-time, they don't get their ACA coverage. But even worse, it's actually a way to make it so that the people who otherwise would be entitled to ACA coverage will no longer be because the company no longer has 30 full-time employees. So all those people just fall into that safe harbor. All right. That's why they call it the "Race to 29", because this law actually creates a dual incentive to part-time people. Now, that said, that's just so you understand why that's happening. But everybody's company is different, your business realities are different and I just want to make sure that you understand what your options are and what it means, what these things all mean. Okay, so with that in play, if you are a large employer and you have more than 30 full-time employees, not full-time equivalents, you have more than 30 full-time employees and you are thinking that some of them might be going on an exchange to get one of those credits, okay, that's where you're getting into the tax penalty zone. So we can move on, Derek. So then, you have your choices. Okay. Of course, the first choice is to offer insurance to your employees, or continue to do so if you already have. There's going to be, again, you get one more year to figure this out if you're between 50 and 100, but if you're over 100, you've got to do it now. And if you're over 200, the rules are different. So if you have over 200 full-time employees, meaning you're a very large agency, you need to have an automatic enrollment in place. Now, you can still have a stability measurement period. In fact, we should talk because that's absolutely something that you should set up, so that you can give yourself more time to evaluate, to get around the automatic enrollment requirement. But if you're over 200-plus, you pretty much have to have an insurance in place and you have to have the automatic enrollment. Or you can very dangerously try and go towards the penalty side, but I wouldn't recommend that if you're that large of a company. Of course, what are the reasons why we see among agency clients that I have, why playing makes sense in practice? Well, because at least in California, there's a bit of a talent war for good caregivers. So offering good benefits, offering insurance. Whereas other companies are cutting hours, making people part-time, doing things like that might be a recruiting incentive. And also, there's a tax incentive to it. If you're going to pay, meaning you're just going to pay the penalties, you can't deduct those, okay? You can't deduct penalties to the IRS, but there are deductions that are available if you pay the cost of your employees' health insurance. So there's some tax benefits to playing as well. And of course, if you're one of those small companies; if you're fewer than 25 employees and FTEs, I've actually had a couple of those want to still provide coverage. Number one, because they want good talent and they want to grow and they're thinking they're going to be bigger soon. And number two, you get a 50% tax credit, just a straight credit. So you can actually use those health insurance contributions as a tax shelter for your business. So that's another reason to do it. So the law is not completely punitive to employers. It's trying to also give you some incentives to play. So how is this done? How do you understand? First of all, you certainly should contact an insurance broker if you're going to want to play. If you want to actually provide a plan of insurance to your employees, I believe that the insurance professionals are the best ones to talk to about that. Of course, you are the best people to understand your margins and to calculate, really, what you can do. A lot of the time, this is the most important factor. Because you might want to do the right thing, you might want to have incentives for employees, you might want to have a lot of the soft value elements, but if you just can't afford it, you can't afford it. So you need to look at how much this is going to cost them and talking with a broker can help you with them. There are a lot of elements to it based on age and age of your workforce and there's a lot of things that come into play. But what you need to know from a legal side and from a compliance side is whether the plan that you're being offered follows two elements. Affordable and provides minimum essential coverage, okay? Those are the two things that have to be done and I wouldn't rely on a broker for that. But I would certainly ask the broker straight up whether the plan is going to satisfy these elements. Now, what does that mean? If it's affordable, it means that the portion that the employee contributes cannot exceed 9.5% of their household income. Now, the IRS has said, "We're going to look at box 1 on the new W-2s that have come out," and basically 9.5% of that is the maximum that they can pay. Now, that's only for themselves, okay? If they want to also have insurance for their dependents or their spouse, then you don't have to worry about that. Whether it's affordable is they have to pay 9.5% of just their household income. All right, and then minimum essential coverage. In your first year of compliance, it means that you have to offer it to at least 70% of your employees, okay? After that, it's going to go up to 95%, all right? And also, under minimum essential coverage there are all of the things that have to be covered, but that's going to be up to the broker and the insurance company. And we can talk about that later in terms of what has to be covered. But that's a technical detail that you, as a business owner, shouldn't worry too much about. What you should be worrying about is how many people have been offered the insurance and that's it. Again, they don't have to take it. You can offer it and this happens, right. You can offer it to somebody and they can say, "No, I'm not going to take it, I'm going to go to the exchange and get a credit." There's a lot of reasons why they might do that. And when that happens, that’s a good example to talk about why penalties can occur and why they're actually really, really, really punitive penalties. And then there are just not that punitive...more of an offset for what they've gotten from the government, which actually might end up being cheaper for you. And that's a reason why you need to know the ACA. Because if you know what you have to do, you might still be hit with a penalty, but it's going to be a reasonable one, rather than the very punitive one which is going to happen to those who A, don't know what they're doing or B, are intentionally trying to avoid it all together. All right, so when I say "pay", this is "play". But . . . Derek, if we can go to the next one? When I say "pay", I don't mean just give into the taxes, I mean be smart, okay? I mean analyze your business, understand what's going on and pay the tax penalty that is actually cheaper for you than getting the insurance, okay? And what we're looking at here is if you've done it correctly, you're going to be paying a tax penalty of $2,000 per year, per applicable employee, okay? Now granted, that's not tax-deductible and we covered that before. But if you have done it properly, you're basically only paying a penalty for those employees that have gone and gotten their insurance on the exchange. Okay, I want to be clear about that. If you have put your insurance in place, you've offered it and it's just not what they're looking for. You've offered affordable with the minimum essential benefits and essential coverage, you're only going to pay $2,000 per year if they go and get their insurance elsewhere, okay? Now, it's very predictable. You know exactly what the cost of business is going to be. You can identify those employees who may go and do that. Sometimes, we look at workforces and we say, "Okay, here's your danger zone. Here's all the people that could potentially go to an exchange. Here's all the people that should be getting Medicaid. Here's all the people who are not full-time, so they don't get anything," and we can analyze everything and basically identify who are your danger employees? And if they go, you pay $2,000. If they don't, then you don't. But that's a pay strategy. And it very well could be cheaper, but it depends on your business. And of course, once again, you need to identify how this might impact recruitment. Very often, caregivers are asking if they're going to be getting health insurance these days. If you're in a pay situation, the answer is going to be "no". Again, you might set up a system that is not as good as an exchange. That's, again, going to be your business developments and recruiting efforts. Now, what if you don't do anything at all? Okay, so if you don't do anything at all and you don't offer insurance at all, then your penalty could be much higher. So the government doesn't want you to game the system and not offer insurance at all. Because if you do that, if you don't offer affordable with minimum essential coverage, every single employee who is full-time minus 30, you're going to have to pay a penalty on if only one of them goes through the exchange. Now that's the very punitive provision. That's the one that everyone is sweating about and should be scared, because that's when you start to see the really crazy numbers coming out. You have a company of 200 full-time employees and you've set it up so that really none of them should be going to the exchange, but then one of them does. Well, you now have a penalty of 170 times $2,000, annually. Because of that one person. That's the more punitive part, all right, and that's the part that should concern you. And when you're making your decision of whether to pay or play, you should keep that in mind. That if you're really going to do nothing and if you're not going to at least offer some kind of health insurance to your employees, you could be hit with a pretty major penalty and that's something you should just be aware of before you make that decision. You can go to the next one, Derek. All right, but I don't want to scare off the do-nothing agencies. But I also want to point out some strategies that you have and these are all, again, going to depend on your agency. We talked about the race to 29. This is basically making it so that no employee works more than 29 hours a week. Or to identify those employees who are working like 30, 31, 32 and just mandating them at 29. Doing that is certainly more administratively feasible when you do the measurement stability and administrative period approach. So that's an option that you have. Waiting full-timers, that just basically means - if you have a full-timer, under the ACA, they're a full-timer if they work more than 30 hours a week. So you at least should have them working 40 and sometimes, you have them working even more. Of course, overtime comes into play. It depends on your jurisdiction. But waiting full-timers is certainly something that if you're only looking at the ACA, is a very good approach to take. Trial period employees, seasonal employees. Again, seasonal employees don't count. The IRS is still working on that. But under the ACA, seasonal employees don't count. You don't have to provide them with health insurance. They don't even get calculated into your calculations. And leased employees don't count either. And one of the most recent, I believe it was even late September, the IRS was talking about this concept of common-law employment and how they're going to apply a common-law employment test and they're only going to consider one person being the employer. So if you're leasing somebody, chances are, they're not going to be responsible and you don't have to count their hours, because it's the agency that leased them to you that's going to be responsible under the ACA. Big caveat that could very much be different in your particular jurisdiction, but that's just the way the IRS is looking at it from a federal tax perspective. And Trial period employees, I mentioned, if you have a lot of trial period employees, you really want to have a measurement period in place, especially if you have more than 200 so you can get around the automatic enrollment. So you should certainly educate your staff. We covered this about whether they have Medicaid eligibility and what plans are on the exchange and what credits are available to them. You don't want somebody going to an exchange and getting a policy that's worse than yours. Not only is it worse than yours, then you have to pay a penalty for it. So you certainly want to educate them, educate yourself, know what all of the options that are available to your employees are. So just some quick administrative tips. If an employee is going to work more than 30 hours a week, don't even go through all of this administrative measurements, all that stuff. Count them as a full-time employee and then either put them in your safe harbor, if you're going to pay, or set them up within 90 days to get them signed up with the coverage that you're providing. The measurement period, I can't speak highly enough of it in this industry. Okay. It was almost designed for the home care industry. So if you want to do that, I highly recommend looking into that, bringing somebody on to help you, either a consultant or an attorney and setting that up, because that can be very advantageous for you. And again, these things are going to change. 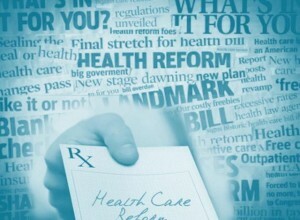 Obamacare, the ACA, it has been evolving over the past four years, it will continue to evolve in practice. It changes almost on a monthly basis. So certainly train someone or have somebody on-call that you can go to for these issues because stuff's going to come up, truth is stranger than fiction and I find it every day, that changing and new challenges coming up. So train somebody on what your policy is going to be and how it's going to be applied and where to go to ask the right questions. Derek: All right. So that's a lot of great information and especially the tips, I think [inaudible 00:42:39]. Of being informed, having someone trained in your office and while Jason went through kind of pay, play or do nothing, we know agencies are like, "Wow, that's a lot of information, where do I start?" And so we've put together a preparedness checklist for all the agencies. 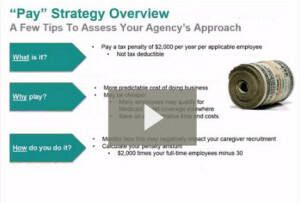 We've boiled the information in this presentation and best practices across, really, the thousands of agencies that ClearCare works with, and we've put together a sequential checklist that agencies can print that will walk them through the very first item that Jason talked about. Calculating how many full-time employees and how many FTE equivalents, and then walking through the different scenarios of paying, playing or doing nothing, as well as making sure that you have the right tools and technology in place. We wanted to quickly share here because as part of that checklist, we know that very first step of knowing what is your exposure? Are you going to be considered a large employer? Whether it's 50 FTEs or the 100 full-time employees. And you need to be able to have a very simple report. And for those of you who are ClearCare customers today, there are lots of you on here, this was actually an agenda item that a couple of you submitted which is, "How can ClearCare help?" And if you're not a customer today, this is certainly a feature that we do offer. Where . . . I'll try to put the mouse cursor over here. Where you can pick the period. So as Jason mentioned, an agency will want to look within that month. However, you can also select the six-month period or any date range that you'd like. And then if you're trying to figure out whether or not you're a large employer based on the full-time employees or full-time equivalents, you can click the two boxes. What that will allow is when you run the reports, you'll see here down at the bottom, the report will automatically run the calculation and will indicate how many full-time employees you have had within that date range that you've selected. And not only will it list how many employees you have based on a number, but it will list the caregivers, which are showing up in that column who've been calculated to qualify as a full-time employee. Now, we also know because part of your work to take that first step is you also need to calculate the full-time equivalents, right? And we know in this industry, many caregivers might have ten hours this week and maybe more hours the following week and there's live-in care. That's a very difficult calculation if you're not on a software system or you're handling this manually today. So the report will also calculate how many full-time equivalents you have and list those caregivers' names, so you can cross-reference if they are being counted as a full-time employee or a full-time equivalent. And then, there's a nice summary tab over to the right which just says, "how many total," counting up your full-time employees and full-time equivalents. "How many employees do you have based on the ACA calculation?" And then there's two columns that will say, "In the past six months, how much are you averaging?" I think Jason brought up a great point. Whenever the IRS gets their act together, if they are an annual basis, even though the calculation period is monthly, we still want you to have a snapshot monthly which we've done here on this report, we set the date 9/1 to 9/30. But you'll also want to have an idea of how you're trending over the last six months. And then, "Are you subject to the ACA employer mandates?" That's kind of the very binary question that most agencies want to answer. Are you going to be subject? Now, again, this is a report and should not be the only factor that determines. You may have agents, you may have future schedules that are already scheduled where caregivers may be put into a full-time or an FTE equivalent that may push you into the large employer. But this is a report that can give you an idea of how close are you to that 50 or 100 threshold and give you a very simple, non-manual way, kind of very automatic way to do that. So if there are any current customers on the call today that have any questions about running this report, you can contact the ClearCare customer service. Or if you're an agency out there that does not have software, or would like to get a little bit closer and see a quick 10-15 minute demo on how this report can help, just contact ClearCare and we'll be glad to share that. So for our takeaway today and then we'll open it up to Q&A. We've got a lot of great questions already coming in. You must begin to prepare today. I think Jason actually opened at the beginning. If you've not started to prepare, you are definitely behind. And we are coming up right into November here in a few days. We want to make sure that you're prepared, which is why we're having this webinar now. So preparing is being knowledgeable about the law. Knowing all the details and how it pertains to your business. And note that we've also provided the ACA overview, quick reference guide that you can download on the link that we provided as a refresher to make sure that you have all of the essential points to understand the law. Then Jason outlined three possible scenarios for you to take once you understand the law. Are you going to pay, play or do nothing? And you certainly have options, but make those informed options. If you're going to do nothing, make sure that you're making sure that you've calculated the risk and the exposure to your business. If you're going to pay or you're going to play, make sure you know the impact. And also understand that as your business changes, your strategy, whether you pay, play or do nothing may be impacted. If you're an agency today with 20 clients and you're growing quickly, by mid part of the year, you may have to adjust your strategy. Making sure that you have the right software to prepare and manage. Even if you set up a simple spreadsheet, you've got to have a way today to make sure that you're staying in compliance. The last and not least here is while the ACA is a federal mandate, your local laws may differ. Your state laws may support or contradict or have additional detail that may interact with the federal Affordable Care Act. So make sure that you're in touch with your peers locally. Attorneys like Jason and his firm across the country represent home care agencies. And an account and an attorney, and as Jason mentioned, an insurance provider in your local market will be the best person to reach out to. Someone local who knows the laws and knows all the changes that are currently in place at your state legislation as well. So with that, we are going to open up for Q&A. I will dive right into the first question. And I'm going to throw this over to Jason; this question came over a couple times is, "If I pick up that strategy, 'pay, play or do nothing', how do I go about understanding when I may need to change my strategy?" Jason: That's a good question and thank you for that question. I think I figured out my audio, so I hope I'm a bit louder now. See you can change your strategy, really, at any point. They say it's hard to turn a battleship. So of course, it depends on how large you are. Like I said before, the IRS is going to look at this on a monthly basis, okay? So your agency could literally change from month-to-month and you could provide insurance one month, not provide insurance another month. It just depends on the logistical complications of working with a broker and getting that set up and whether or not that makes sense from a transaction cost perspective. But you don't have to be committed. Like if you're committed to do nothing, it's not like you can't the following month figure out what you want to do and get your insurance in place. And likewise, if you're providing insurance and you realize that, "Man, this is just too expensive. It's eviscerating my margins," you can always stop doing that, too. And that's certainly the way to go. If you're going to put in the measurement and stability period, it's a little bit more complex because once you have a program in like that, the reason why it's called a "stability period" is because you have to be stable. You have to provide insurance during that stability period. But again, that's a sort of elite, more complex way to go, and if you are going to do that, I do recommend bringing in an expert to help you to set that up. Derek: Thanks, Jason. We have an example here from Jessica Lane. I'll try to summarize here. Jessica mentions, "I offered health benefits last year and all of my caregivers declined participation. I'm preparing to offer it again this year, but anticipate that all will decline this year as well. However, I just offered employment to a new employee, she is quitting her current job with health benefits to work with us," so this is a pretty common scenario. Derek: "I offered her health benefits and asked her to apply through the exchange and I will pay 70% of the monthly premium by adding it to her paycheck, and then she will pay her premium for herself. Will this cause me any problems in the long run? If so, is there a better option to meet this obligation, as I have already guaranteed her health coverage at this 70% employer contribution?" Jason: Okay, that's a very great question. It's a pretty common scenario. And first of all, by providing . . . I want to address the initial issue. By providing health coverage to your employees, if they're all declining it . . . and you know, they have to pay part of it, so if they're all declining it, then you're not going to ever be hit with that major penalty. As an attorney, I always tell clients about the risk factors. Where's your big exposure? Where's your not big exposure? If you're offering the insurance, the big exposure is not there. But you have to analyze the situation and make sure that you're providing affordable coverage, and when you're looking at 70%, that's great. But what you need to do is make sure that, the amount of money that she's making, okay, that no more than 9.5% of that is going towards the health premiums. That's your key metric. All right, so long as that metric is being met, then whatever you provide is going to be ACA-compliant. Now, you say 70%, I don't know how much she's making, but just focus on that metric and you won't have any risk there. Now, if she goes to the exchange and she wants to buy it there . . . I don't understand your question that you're trying to convince her to go to the exchange and you're going to help subsidize her purchase on the exchange. But if you're doing that, there is still, potentially, some liability because if she is a full-timer and if she does end up getting a credit from the government, you're going to have to pay the government back for that anyway - and that's that $2,000 penalty I talked about. So just evaluate the situation, look at your numbers and those are the questions you should be asking. Derek: Great, we have a question from Sam with Aunt Mae. Sam, thanks for weighing in here. "Can the measurement period be different for each employee? What if they leave or stop working during the stability period?" Jason: Great questions, those are very educated questions. No, the measurement period has to be same for every class of employees. In our industry, usually, there's going to be the two classes; admin and field. So you can have a different measurement and stability period for your field caregivers that's different from your office staff, but that's about it. You can't differentiate between your field caregivers and you certainly . . . one of the common questions I get is, "Can I differentiate between a live-in and a non-live-in?" No, you can't do that either. So that's differentiation. On the leaving during the stability period, that ends it. That ends it. So if they leave employment or they're terminated, then that will end the stability period. Opens up a whole new realm of potential wrongful termination cases to get rid of health insurance, but if they leave on fine terms, then the health insurance also will stop. And you go into COBRA, make sure you have your COBRA stuff in place. Derek: Excellent. Got several questions here, too. We're going to try to do a lightning round here. So I've got a question from Danielle at, looks like, M&Q Care. "We will have a lot of people who get Medicaid fully-covered insurance. Do we still need to offer this insurance to them and have them refuse?" Jason: No, you don't. Great question, no you don't. Identifying those employees who are going to be getting Medicaid is great. One of the exceptions to the employer mandate on offering is whether they are eligible for Medicaid. If they are, then you're fine. Derek: Next question. This comes from, again, Sam. "What is the minimum salary to qualify for the exchange? Our caregivers may not make it up to qualify for the exchange." Jason: That's correct. If you don't qualify for the exchange, you have to look at your local rules. Like, here in California . . . that's a very relevant question because in various counties, that threshold to qualify versus qualifying for Medicaid is fairly high. So you're right. If they can't qualify for the exchange, then if you want to keep a happy workforce, I would inform them about their Medicaid options. Derek: Great. Question from Beverly Dance [SP]. Beverly asks, "If I have part-time employees that work 30-plus hours, two weeks a month, should I add them as a full-time employee?" Jason: Let me get that right. 30 hours per week, two weeks per month? Jason: No, they would not be full-time employees. You can do one of two metrics. You can do either 30 hours a week or 130 hours a month. So if they're not at 130 hours a month, which these are not, they're also not at 30 hours a week. I would not automatically count them as full-time employees. Derek: I think this was covered, but there's a lot of questions here. This question is from Rhonda. "Even if we offer affordable minimum essential coverage, will we still be penalized if an employee goes to the exchange and receives a subsidy?" Jason: Yes, you will. You will be penalized at the much lower penalty. That's what I talk about, the big exposure versus the little. If you provide affordable coverage with essential benefits and they still go to the exchange and get a subsidy, you're going to be hit with a $2,000 penalty. If they get a subsidy on the exchange. If they go to the exchange and they're a millionaire and they don't get a subsidy, they don't qualify for a subsidy, of course you don't pay. It's only if they get a subsidy from the government on an exchange. Derek: The next question comes from Tyson. Tyson is asking, "Is the race to 29 just counting those employees who are currently not insured by the company? Jason: That's a good question, I think I understand that. Yeah, I mean if you're providing health insurance to somebody who's working less than 29 hours per week, then you're providing . . . yeah. I mean you shouldn't be providing insurance to somebody who's working less than 29 hours a week. So if you're already providing insurance, then it's probably for your full-time employees. But the race to 29 has impacted those who already have health insurance and that's what we've seen some of the articles in social media about people who are losing their insurance because they're being brought down into this part-time area. It's a very dangerous thing to do and I would never recommend it as an employer for a lot of reasons, but that is happening. Derek: Excellent. We have a couple more questions. We'll take one or two more and we'll also document all these questions. Housekeeping questions that keep coming in is, "Is this webinar recorded?" Yes and we will send that out to all the attendees. Let's see. Just a definition question. A few questions on, "What's a safe harbor? What does 'safe harbor' mean?" That's a question from Beverly. Jason: That basically means that you have 30 . . . you basically have 30 full-time employees before you start to get hit with penalties. How can I explain that a little bit better? I mean I'm definitely explaining it out of context. Just give me one second. So basically, what that means is if you have less than 30 full-time employees, like full-time, not full-time equivalent, actually 30 full-time employees, then you have no danger of ever getting hit with a penalty. If you have 29 full-time employees and all 29 of them go to the exchange and get credits, your tax penalty is going to be zero, okay? And that's what the safe harbor is. Derek: All right. There's a question here from Jessica Lane that we'll end on. It's kind of a tactical question. It's a question, but I'll phrase it in a different way to you, Jason. The question is, "Do you have a questionnaire or statement form that we can provide our employees to accept or decline insurance that is compliant?" I'm not aware that ClearCare has something like this. The attorneys, Jason Brown's firm could likely assist with that. But on a procedural question, Jason, for agencies that are offering insurance, do they want to make sure that it's documented? That they're sending an e-mail, paper? What do you recommend is a way to . . . is it okay just to offer that verbally? Jason: So this is, again, a very recent thing the IRS has been doing and this is a very technical question, but a good one. All the IRS is going to care about is what you report on your tax forms, okay? Remember, the ACA is being administered by the IRS. The new W-2 forms have a section on them that talks about how much you contributed to the health insurance, for the purposes of satisfying the affordable minimum essential coverage. It's going to be easy for the IRS to calculate that 9.5% because all they're going to see is how much did the person make and what did you contribute to their health insurance? So as long as you are reporting that properly to the IRS, that's really all that's going to matter for the ACA. Now, if you get audited by the IRS, of course you're going to want to have those records. So you're going to want to have the records of what you offered. But of course, if they decline it, then the amount that you put on there is going to be same. Because if you look at the form, it doesn't say, "How much did you give them?" It's, "How much did you offer them?" Okay. So when you're reporting to the IRS, it's about the offer, not the actual provision. That's your paper trail in terms of the IRS. So yes, it can be oral. If you want it to be, that is in place. That said, I'm a lawyer, I like everything in writing. So if you can send a memo or a letter or memorialize in writing and create a best practice, I do believe the best practice is to memorialize what you're offering in writing and whether or not they're going to accept or decline it. Derek: Excellent. While you were answering that, we had . . . looks like a current customer of ClearCare. Jennifer notes that in the ClearCare platform, you can send an e-mail or a text to a caregiver and their response is automatically documented in the system to kind of keep that documentation. Derek: So we are just a bit over our time here, so I want to thank Jason for all of his knowledge here today. We've put his contact information, his e-mail address with his current firm at Fisher & Phillips on the screen. Feel free to reach out and contact Jason. Thank you to all the agency owners, marketers, coordinators on the call. Again, recall this is something we have to move through, but we're in the car wash, we're going to get through it on the other end together. And if you have any questions on this webinar, please contact Jason or ClearCare and we will send out the notes and the recording here shortly in the next day or so. Thank you so much, have a great week. And thank you, Jason.